When I spoke with the author of Garlic Bread for Eugene at the Book Expo in NYC, we discussed that there is a lack of good books for kids that are dealing with the loss of a family member. Too often, authors write in an adult voice when speaking to or on behalf of kids. Michael Heath does a great job capturing how kids think and act and writes it in a way that kids will relate to, even while addressing mature subjects like death. Henry and Eugene, the main characters in the book, are brothers who recently lost their father. The end of the school year has arrived and Henry is about to receive a perfect attendance award – an award that he has strived for all year long. But, his brother Eugene needs to bring a food from home for the end-of-school-year celebration. Their father made really good garlic bread and in the past had made it for Henry to bring to school. Now Eugene wants it and Henry must choose whether to go to school to pick up his award or go home to cook the garlic bread for his younger brother. Even though most of the book deals with how a boy quickly must become the “man of the house,” the sub-story about the relationship between the brothers captivated my attention. I was so caught up in the story at one point that I missed my subway stop. As I read it, I wondered how my children would adapt if something happened to me. I pictured my oldest son in the role of Henry and couldn’t help but wonder what choice he would make. 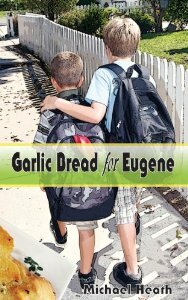 Garlic Bread for Eugene is a touching and sweet story that kids and adults will enjoy reading separately or as a family. Age suggestion: 9 and up.